The Guam Rail, Gallirallus owstoni, is a flightless bird, endemic to Guam. The Guam Rail disappeared from southern Guam in the early 1970s and was extirpated from the entire island by the late 1980s. This species is now being bred in captivity by the Division of Aquatic and Wildlife Resources on Guam and at some mainland U.S. zoos. 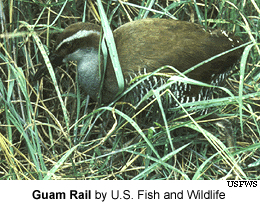 Since 1995, more than 100 rails have been introduced on the island of Rota in the Commonwealth of the Northern Mariana Islands in an attempt to establish a wild breeding colony. Although at least one chick resulted from these efforts, predation (largely by feral cats) and accidental deaths have been extremely high. A small number of birds potentially persists. The National Zoo in D.C. has Guam Rails that are overpopulating, because of the fact that they lay too many eggs. Beginning in the mid 1960s, the Brown tree snake decimated Guam's native avifauna. The birds of Guam evolved in the absence of snake predators. They had no experience with such a predator and lacked protective behaviors against the snake. Consequently, they were easy prey for these efficient, nocturnal predators. As the snakes spread across the island, the number of snakes began to grow exponentially and bird populations declined. Nine of the 11 species of native forest-dwelling birds have been extirpated from Guam. Five of these were endemic at the species or subspecies level and are now extinct on Guam. Two of these species, the Guam Rail and the Micronesian Kingfisher, are being captively bred in zoos in the hope that they can eventually be released back into the wild. Several other native species exist in precariously small numbers, and their future on Guam is perilous. The history of this decline starts shortly after the introduction of the Brown tree snake, although appreciable losses were not evident until the 1960s. By 1963, several formerly abundant species of native birds had disappeared from the central part of the island where snakes were most populous. By the late 1960s, birds had begun to decline in the central and southern parts of the island and remained abundant only in isolated patches of forest on the northern end of the island. Snakes began affecting the birds in the north-central and extreme northern parts of the island in the 1970s and 1980s, respectively. Most native forest species were virtually extinct when they were listed as threatened or endangered by the U.S. Fish and Wildlife Service in 1984.